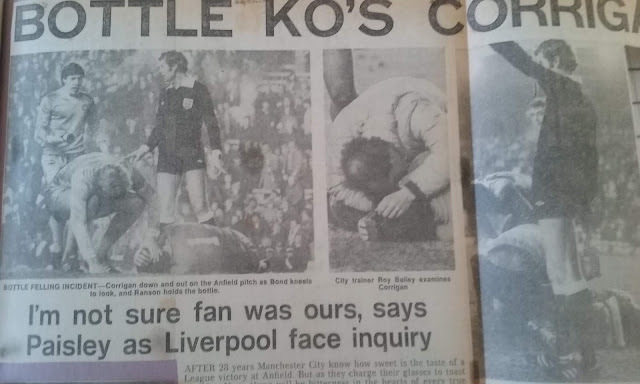 Bott might have been referring to the shock 1-3 defeat to a team for whom wins at Anfield were as rare as hen’s teeth, but in fact was talking about an incident in the second half when the Kop, growing restless at a damp squib of a Liverpool performance, produced an infamous piece of theatre still remembered to this day. From within its listless, disgruntled body of support, a wine bottle had flown out and struck City's Joe Corrigan on the head. 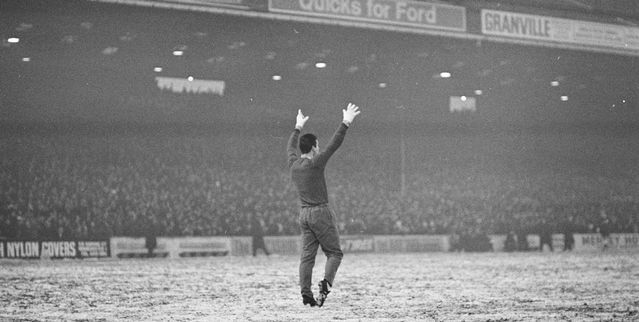 The big 'keeper had required several minutes of careful medical attention before carrying on, with – it has to be acknowledged – the sound of the Kop behind him singing “England’s Number One” to him as recompense. City’s win had been an astonishing 28 years in the pipeline and there would be a wait of a further 22 years before Nicolas Anelka’s double rocked the Kop End of the ground again for City’s next victory on Liverpool’s holy soil. Incredible numbers in themselves, but not really what I am trying to illustrate here. 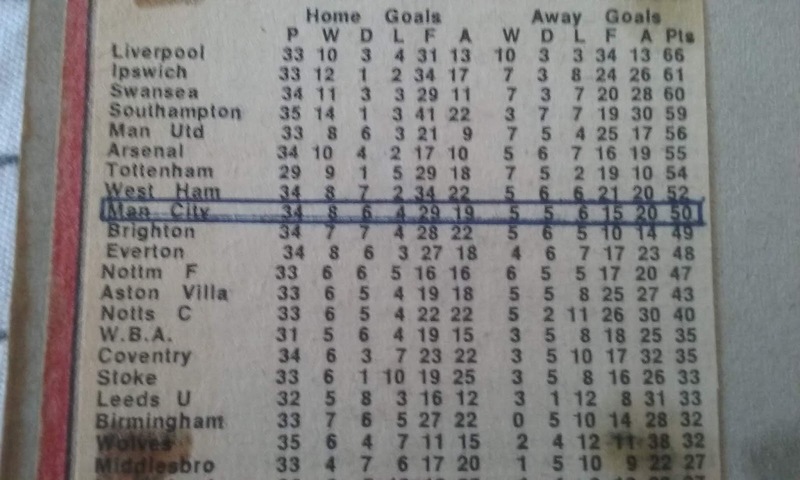 The defeat in 1981 left champions Liverpool trailing in the somewhat unknown territory for them of 12th place, behind such luminaries as Brighton, Forest, Ipswich and even Everton. 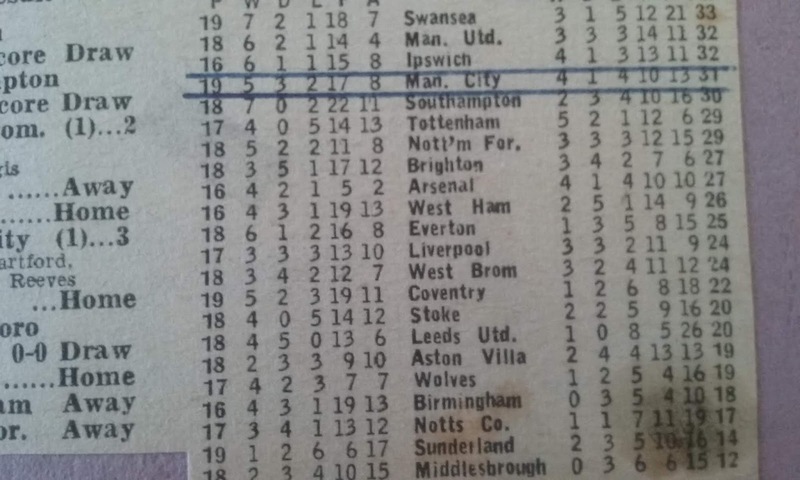 Leaders Swansea were a full 11 points up on Liverpool at that stage. A funny thing happened just after that Boxing Day massacre, however. Two days later City walloped Wolves to go top of the table and the excitement around John Bond’s side’s title push reached fever pitch. The next time the two sides met was at Easter, at a sunlit Maine Road. It was 10th April and what we will call normal service had been resumed. A 5-0 romp for Liverpool sent them five points clear at the top of the table. 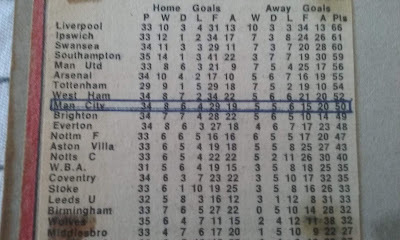 The league title would be theirs within weeks, a monumental turnaround that bears few precedents in modern times. first two league title wins in the recent surge back to the top of English football. First Manchester United then Liverpool were hauled in with almost no breathing space left as City edged through under Roberto Mancini and recent Liverpool nemesis Manuel Pellegrini. If City win this year’s title it will also be quite a feat. From a sizeable gap a month ago, City’s nervy win at Goodison has edged them back in front of a puffing and panting Liverpool side. City’s great advantage is what has been illustrated above. 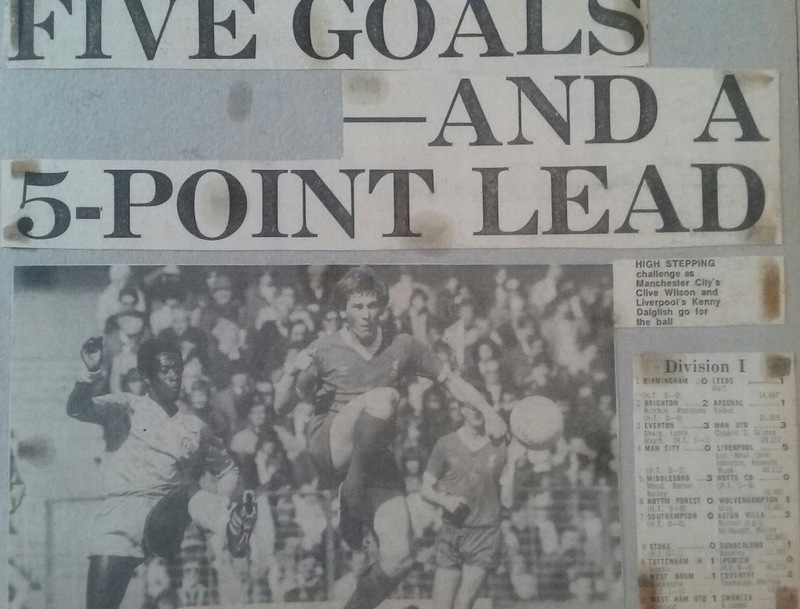 As with those wonderful Liverpool sides of the 70s and 80s, they know how and when to win. Years of winning crucial games has left them with an obvious big match mentality. Some games last season were operated on a strictly auto pilot basis and, while this term’s form has been too patchy for that kind of controlled drifting, there is a feeling about Guardiola’s men that says they will and can turn it on when they have to. 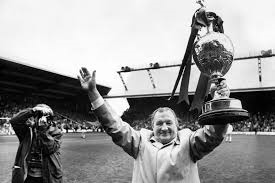 Arsenal was a case in point, although it is perhaps dubious these days to claim Arsenal present a proper challenge to would-be title winners, so far has their star fallen in recent times. Chelsea may provide a better litmus test of City credentials this weekend and will also provide us with a pointer for this month’s Caraboa Cup final at the same time. Certainly the win over Liverpool at the Etihad at the end of the year was a case in point. The crowd was up for it, as were the players and the result was there for all to see. It is that game more than any home draws with Leicester and away stalemates at West Ham which has set the Anfield cat amongst the pigeons. Liverpool know they are good enough to beat most of the rest of the league. They know their improvement this season has been vast, but they had been waiting all season to see if they could get the better of their main rivals for the title. That they couldn’t will have amplified every grain of self doubt that exists at Anfield. There is no getting away from the fact that City were too hot to handle, proving their quality and credentials. This creeping self doubt was evident in the draw at West Ham, where Liverpool looked nervy and unsure of themselves. 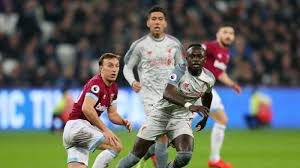 West Ham captain Mark Noble noted the same from close up, saying he and his team mates could see how nervous the Liverpool players were under the pressure of scrutiny from the football world on a Monday night. The disability seemed to grip the entire team too. Alisson’s clearances were shanked into touch, Joel Matip ran time and again into trouble, Keita and Fabinho delivered cheap possession back to the Hammers and Firmino went through the full repertoire of the Man Who Has Lost His Mojo. Salah and Mane were quiet and unable to influence the flow of events. 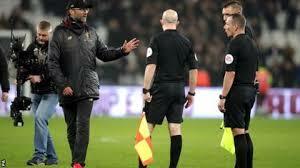 Even manager Klopp decided the luck of getting an offside goal to start things rolling was not enough to stop him complaining vehemently about the referee's performance. It was all quite a spectacle. Liverpool’s injuries will certainly be cited in some quarters as having an effect, but all teams suffer these kinds of setbacks and City have suffered more than most on this front. Kevin de Bruyne’s sumptuous through ball to Gabriel Jesus for City’s 97th minute clincher at Goodison was a timely reminder of what the team has been missing for so many months this season. That clinical eye for an opening made a very welcome return and is likely to play an increasingly important role in the rest of the club’s season as the Belgian regains match fitness and hones that intricate passing technique. Liverpool, shorn of some of their influential performers, can only groan at the timing of De Bruyne’s return. City, meanwhile, working up a head of steam at just the right time, are taking a leaf out of the great Liverpool success stories of the past. That winning mentality never really leaves you and when the going gets tough your big game players start to come to the fore. For Liverpool, the big players are either missing or malfunctioning. Bournemouth, notoriously bad travellers, can provide a fillip this weekend, but anything less than a clear victory will continue the gnawing process of self-doubt that was set in motion on that calamitous night at the Etihad in late December. 7th February 2019 - Tuesday, January 29th: elation. Wednesday, February 6th: deflation. I hate football at times. From the moment City lost at Newcastle, things have gone pear-shaped for Liverpool, at least in the context of this relentless title race. A glorious chance to open up a seven-point lead gone, a predictably feeble performance by Arsenal at the Etihad, a limp showing at West Ham and Everton replicating the Gunners’ generous antics has seen the title race take another twist. The West Ham game was a curiously flat night for anyone of a Reds persuasion, whether it be Jurgen Klopp, his players or even the fans inside the London Stadium. You would have expected them to fly at their opponents, proving a point to City after they cruised past Arsenal, but it was the opposite. It felt like an April game when the Reds are sixth in the table with nothing to play for. When Sadio Mane put Liverpool ahead, aided by the latest hapless piece of officiating, it still didn’t feel right. The energy was lacking, the passing wasn’t crisp and the equaliser was inevitable. From that point on, a win was never coming the visitors’ way. West Ham fully merited getting a point in the end and arguably deserved all three. They were excellent, particularly Declan Rice, who looks one hell of a prospect. I hate talking about injuries but I’m going to talk about injuries. Liverpool were unquestionably hampered by them, making for a mishmash of a display that never clicked at any point Joel Matip is looking more inept by the game and is even a major step down from the error-prone Dejan Lovren, whose stock is rising purely by being out of the team. Joe Gomez and Trent Alexander-Arnold’s continued absence at the back is particularly troublesome, however, with two of England’s brightest young players adding so much when they play. They are already indispensable. A makeshift defence featuring James Milner at right-back looked all at sea throughout, with even near-perfect duo Virgil van Dijk and Andy Robertson not at their best. "Jordan Henderson and Gini Wijnaldum are also influential figures who were unavailable, with a midfield-three of Fabinho, Naby Keita and Adam Lallana taking to the field for the first time together." 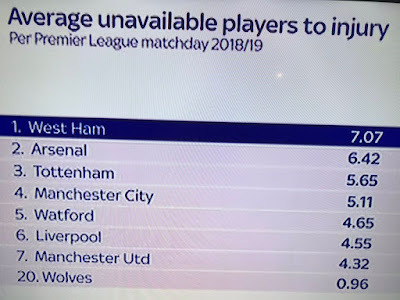 Any team without four such prominent players is going to struggle and this West Ham side are dangerous when they want to be. Under the lights of the London Stadium, with the whole country watching on, it was always going to be tough. A quick word on Roberto Firmino, by the way, who is Liverpool’s most unique, intelligent player - arguably my favourite in red - but who played like a hungover 50-year-old on a Sunday morning at the local rec. He was truly horrific. After the final whistle, the predictable comments surrounding Liverpool being ‘bottlers’ and crumbling under pressure resurfaced, but this is a minor speed bump in an otherwise fantastic season. They are under pressure for sure, and are a young side who may not always cope with it to perfection, but don’t let two draws fool you. I fully understand that it’s all part of the tribalism that exists these days, and yes the Reds have pathetically only won one trophy in the last 12 years, but this lot are not bottlers. As someone naturally pessimistic as a football fan, take my word for it. They haven’t even lost during this two-game lull, for christ sake, and have only been beaten once in the Premier League all season. They are on course for the best points total in the club’s entire history. A club with 18 league titles and five European Cups under their belt. 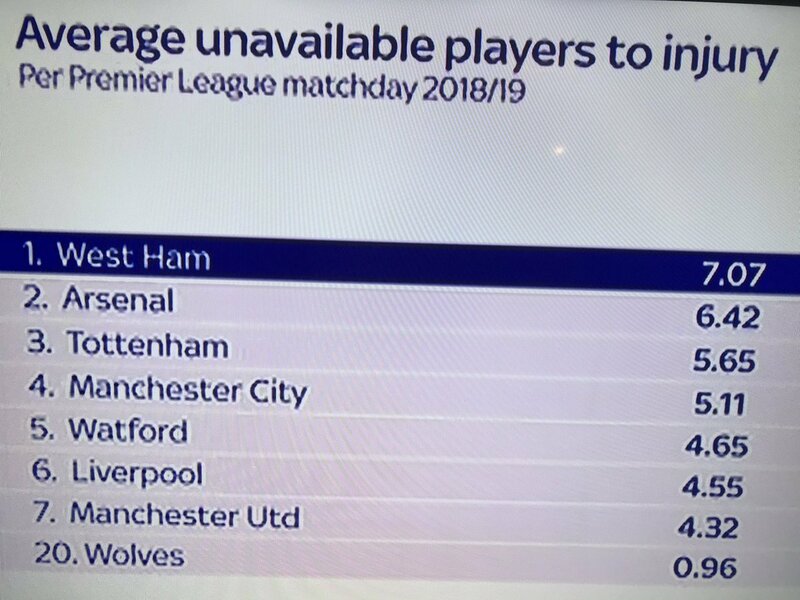 Bloody bottlers. If they don’t win the title this season it will be for one reason only: they are up against a wonderful City team who look increasingly like peaking at just the right time. There was no chance Liverpool were ever going to win at the Etihad last month, opening up a 10-point lead in the process. It all sounded too perfect, and frankly, Pep Guardiola and his numerous world-class players were never going to allow it to happen. This resurgence is no surprise in the slightest - Guardiola is over-egging it, which I get - and it isn’t some remarkable turnaround like Manchester United managed in 1995/96, or City did to their local rivals late on in 2011/12. But the narrative doesn’t allow you to think that way, does it? 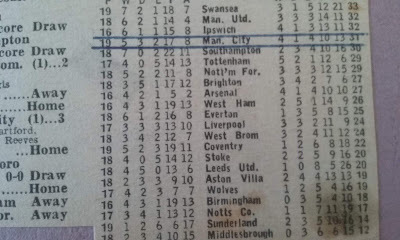 Liverpool have supposedly lost about four in a row and their rivals have gained 15 points on them! Since the turn of the year, City have picked up 12 points from a possible 15, while Liverpool have collected eight from 12. 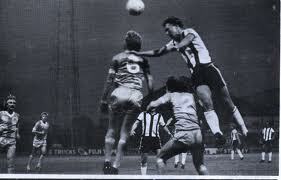 That includes the meeting between the pair, when City were both expected to win and slightly fortunate to. So, the Reds have dropped one more point than City and not lost in 2019 to date. What a crisis. The biggest concern from a Liverpool perspective shouldn’t be the team not recovering from back-to-back draws - they will - it’s what City are now capable of. They know how to win, which is a huge advantage. The ability to get over the finish line can be a priceless asset, as Real Madrid have shown in winning three Champions Leagues in a row. They haven’t been the best team in Europe that time, not even close. They just built up a winning mentality that proved unstoppable, as well as benefiting from endless poor refereeing decisions and good fortune. City’s defeat at Newcastle may begin to feel like an increasing anomaly, I fear, with the reigning champions in such control of every match I watch. They have strong characters throughout the team, from the still underrated Ederson right the way through to Sergio Aguero, who is in such good form I fear him every time City play. Fernandinho could be one of the most snide players in Premier League history, which is a huge compliment from someone who adores a snide player in his own team (Liverpool lack them). He is a born winner. His ability to commit about 54 yellow card offences a game and rarely even get booked is unfathomable, and he is also a master a winning his own free-kicks. Bernardo Silva is what I like to call an underrated snide, too - a player who isn’t tagged as a master of the dark arts because he is a creative talent. See also: Cesc Fabregas, Xabi Alonso and Dennis Bergkamp, to name but a few. He is a horrible little pest, getting in the faces of referees, wasting time and generally being a nuisance. If you hadn’t noticed this, it sums up why he is an underrated snide (and a fantastic footballer)! So, on we go to the next batch of fixtures. For all that has been said, you could be forgiven for thinking Liverpool are now about five points adrift and in danger of falling away completely. In case you missed it, they will go top again with a win or a draw against ournemouth, having played the same number of games as City. Not bad for a team supposedly falling apart. Of course, fresh question marks will be raised if they fall short against the Cherries, not least the question of “what in god’s name happened on that training camp in Dubai?”, but I expect both a tough game and a return to winning ways. City will beat Chelsea as well, with Eden Hazard no doubt getting prepared to shrink at the Etihad before turning into Lionel Messi at Anfield in April. They are in total command at the minute and don’t see how the west Londoners a) keep them out and b) cause them enough problems going forward. If you think I’ll be one of those childish fans revelling in ‘bottlers’ Liverpool being top again for 24 hours all least, should it happen, you would be absolutely correct. It’s no more pathetic than the many who have overreacted to two below-par draws against two of the strongest teams outside the ‘big six’. City are undoubted favourites in my book, but don’t go writing Liverpool off just yet.